Enjoy a 3 night, 4 day stay for 2 guests in a stunning Grand Deluxe Pool Villa at the beautiful five star Aleenta Phuket Resort & Spa on the pristine Natai Beach in Thailand. Stay includes: daily gourmet breakfast, complimentary wifi and 10% discount in the Spa and is valued at approximately $2,500 USD / £1,845 GBP*. Prize stay dates: to be booked in advance and taken before 31 October 2018 or between 01 May – 31 October 2019, excluding stays over public holidays, long weekends, 1-10 October 2018/2019 (Chinese National Day), 1 December 2018 – 31 January 2019, and Chinese New Year, subject to availability. 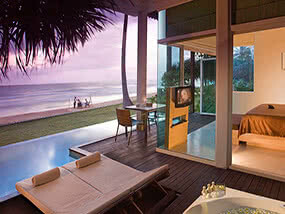 The beautiful Aleenta Phuket Resort & Spa is a boutique luxury beach resort and villas in Phang Nga, Phuket. Located on the sunset side of the Andaman Sea, on the pristine Natai Beach, the property lies just 20 minutes from Phuket International Airport. The resort concept is: “all suites, all private” and this is delivered in luxury suites and villas, which come with plenty of private space. Aleenta’s luxury resort accommodation range in size from 80sqm for smallest suites to up to 5 bedroom beachfront Grand Villas. Guests will enjoy unparalleled levels of service from professional and courteous staff while exceptional fine dining can be enjoyed at The Edge Restaurant and The Natai Restaurant. The spa boasts a natural detox programme which centres around healthy lifestyle as well as yoga retreats led by a private instructor. The hotel also offers casual all day dining with the beach lounge offering drinks and snacks throughout the day. There is also a fully equipped gym and a kids club at the resort, offering youngsters the perfect place to learn, play and explore. The winner and their guest will be staying in one of their incredible Grand Deluxe Pool Villas which have been designed to embrace Aleenta’s ‘Outdoor Living – In’ concept by creating a harmonious flow between the large private pool and the expansive interior of the luxury villa, you can simply walk out to the pool or Jacuzzi straight from your bedroom! Each private villa features its own private day bed, garden views and lies within 100m of the beach. Each villa also benefits from a beautiful bed with 360 thread-count Egyptian cotton sheets, individually adjusted air-conditioning, LCD large-screen TV with cable TV, fully stocked minibar, safe and complimentary wireless internet access throughout entire resort. The bathroom will also include natural cotton bathrobes, slippers, big luxury towels and all-natural toiletries with essential oil extracts exclusively designed for Aleenta. Luxury Travel Diary terms and conditions apply. *This auction item is valued at approximately $2,500 USD by Aleenta Phuket Resort & Spa, Natai Beach, Phang Nga, Phuket, Thailand – please note this valuation is the list price provided to Luxury Travel Diary by the Auction Prize Provider and should be used as a guide only as cheaper discounted rates may be available. No cash alternative is available. This auction item excludes flights and transport – you will need to arrange your own flights / transportation to and from your home to Aleenta Phuket Resort & Spa, Natai Beach, Phang Nga, Phuket, Thailand to coincide with your booking. Your stay is subject to availability, must be booked in advance and taken before 31 October 2018 or between 01 May – 31 October 2019, excluding stays over public holidays, long weekends, 1-10 October 2018/2019 (Chinese National Day), 1 December 2018 – 31 January 2019, and Chinese New Year. Please note any associated taxes / resort fees / entrance fees etc. will be collected from the winner by the relevant property at the time of booking your stay or on departure and will not be deducted from the amount bid for the item. Winners must pay for their auction item in full via PayPal within 48 hours of the auction end, otherwise Luxury Travel Diary Ltd. reserves the right to offer the auction item to the next highest bidder with immediate effect. To the fullest extent permitted by law, Luxury Travel Diary will not be liable for any loss or damage arising out of the winners’ use or enjoyment of the prize; and the winner acknowledges that Luxury Travel Diary accepts no responsibility whether directly or indirectly for any claims whatsoever arising in respect of the prizes provided by third party providers or sponsors.